This opinion piece was published on Politico, La Republicca, Die Zeit, Kathimerini, and others. As always, the respective titles in the newspapers were NOT drafted by me. European Commission president Jean Claude Juncker has announced the creation of a European finance minister position. In his vision, outlined by his “state of the union” address in September, the role would unite the position of Commission vice president, chair of the Eurogroup and head of the euro area portion of the EU budget. But the proposal is ill-designed and will create more problems than it solves. Such a position as Juncker proposes is not that of a finance minister and the misnomer will create mistaken expectations and confusion. A finance minister typically can raise taxes, sets priorities for spending and can go to the markets to issue debt. In federal systems, the federal finance minister typically also plays a role in overseeing and controlling the fiscal affairs of the different regions. Accordingly, a European finance minister will raise great expectations. Some will hope that this ‘finance minister’ will be a strict budget enforcer, finally bringing fiscal discipline. Others will look forward to tapping the new EU fiscal resources. The reality is that Juncker’s finance minister will have the power to do neither. The proposal is institutionally problematic, as it unduly mixes the role of the Commission with that of the Council. The European Union is built on a fine balance between community interests and national interests. Essentially, this balance gives the European Commission primacy in initiating legislation and in issuing recommendations in the context of Europe’s fiscal rules. Meanwhile member countries have supremacy in taking final decisions on the rules, and the Council of the European Union and the European Parliament have the final say on legislation. There are practical considerations, too. The chair of the Eurogroup needs to be accepted by the national ministers in order to exercise authority. An appointment by the Eurogroup is therefore preferable to imposing a chair from an outside institution. Nonetheless, the current set-up is problematic and requires change. 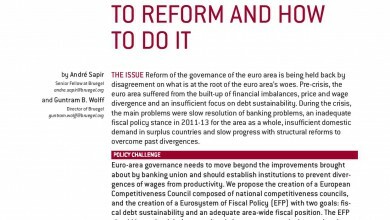 Beyond the long-overdue reform of Europe’s fiscal rules, institutional reform is needed. The Eurogroup lacks transparency. Its president is a national minister, which leads to impossible conflicts; the preparation of the Eurogroup president is done by three different institutions; the time devoted to chairing such an important gathering requires a full-time position, and there are conflicts of interest between the national mandate of the minister and the interests of the euro area as a whole. Instead of creating an ill-designed European finance minister role, the European Commission should therefore propose to make the Eurogroup president a full-time position with a clear European mandate. A full-time president should defend European interests in the gathering of national ministers. Moreover, she would be the person defending jointly taken decisions in national contexts such as national parliamentary debates. Last but not least, such a full-time president should regularly report and explain Eurogroup decisions to the European Parliament – perhaps back-to-back with the President of the European Central Bank, for example. Juncker and French president Macron still have a point –Europe needs a discussion on budget. The obvious starting point is the EU budget, which should be reformed to reflect European priorities in the 21st century. Emmanuel Macron’s list of priorities for common initiatives – such as security and defence; border control and migration; research and common climate policies – are sensible and widely shared. A reform that would redirect resources from the spending of the 20th century, such as the common agricultural policy, to these new priorities is sensible. President Juncker’s idea to create specific mechanisms within the EU budget for the euro area also deserves serious consideration. It would be unwise to create totally new euro area institutions beyond the ESM that would only aggravate the division between countries inside the euro area and those outside. Instead, the EU budget itself can provide some useful elements towards stabilisation. Some of the EU budget lines could be made more contingent on shocks to provide meaningful support. For example, in case of a large inflow of immigrants, a member state like Italy should receive support from the EU budget. It is also a good idea to create some form of a ‘rainy day’ fund within the EU budget that would be available to help countries hit by a strong shock. The Commission should focus its energy on reforming the EU budget and making it more useful for citizens. It should move away from the creation of an institutionally and politically ill-conceived finance minister role. Increasing the importance of the position of Eurogroup chair and establishing accountability to the European Parliament will also improve fiscal governance of the euro area.